My wife and I have been members of Samaritan Ministries since shortly after getting married in 2012. For reasons I've detailed elsewhere, we opted out of the insurance scene and chose to do health care sharing with Samaritan. If you've never read my posts about health care sharing and are unfamiliar with the process, here's a quick rundown. Health Care Sharing Ministries (HCSMs) are primarily religious-based with minor exceptions. Members agree to a statement of faith and a standard of lifestyle choices. Guidelines govern what medical needs are eligible for sharing (generally with limitations on some pre-existing conditions, and most "preventative" care is not eligible). Medical needs that meet the guidelines are submitted to the HCSM, and those bills are divided and shared by the members at large. As HCSMs are not insurance, members are considered to be self-pay patients and generally able to obtain large discounts on medical bills, cutting down on costs. For Samaritan Ministries in particular, monthly membership levels (analogous to an insurance premium) range from $100 for a single individual on Samaritan Basic, to $495 for a family of 3+ members (3 or 10, doesn't matter) on Samaritan Classic. Members are responsible for the first $300 of a medical need with Classic, and the first $1500 with Basic (analogous to a per-event insurance deductible); those amounts can be lowered dollar-for-dollar by self-pay discounts you receive on your bills. You can find more information about specific costs for your family situation and details on the two plan options here. One of the unique aspects of Samaritan Ministries is that members send their monthly shares directly to members with medical needs and are encouraged to send a card or note. All of the other HCSMs have members send their payments to the main office for distribution. Now, to our latest experience with health care sharing. In our five years as members of Samaritan Ministries, we have submitted three medical needs for sharing with fellow members: the pregnancy and birth of our daughter in 2015, my 2015 emergency appendectomy, and the pregnancy and birth of our son in November. This is what health-care sharing with Samaritan Ministries looks like! Samaritan members are encouraged to send cards or notes with words of encouragement and prayer to those who they are assigned to send money to each month. 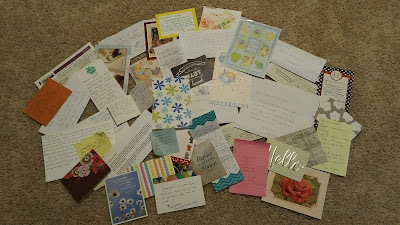 With this latest medical need, we received cards from as far away as Delta Junction, Alaska! The cards pictures above came from members in the following states who were assigned to share our medical need: Alabama, Alaska, Arkansas, California, Colorado, Florida, Georgia, Illinois, Indiana, Kentucky, Michigan, Missouri, Montana, Nebraska, North Carolina, Ohio, Oregon, South Dakota, Tennessee, Texas, Washington, and Wisconsin. Being a self-pay patient can sometimes result in a little more work (primarily through having to explain that you don't technically have insurance and don't want to sit through a presentation on why they think you need it), but almost always results in significantly lower costs. As an illustration of the fraud that is modern health care, we got a 70% self-pay discount on a $44,000 bill -- a whopping $31,000 was knocked off leaving us with a $13,000 bill. The inflated costs of healthcare due to insurance paperwork and flat-out overcharging is absurd. Health care sharing is a free market solution that results in lower costs and greater flexibility for consumers. Want to learn more about Samaritan Ministries? Read more about our past experiences here, or contact me via email for more one-on-one discussion.